Foreign Investment – Threat or Economic Boost? The notion of foreign investment in American businesses and properties raises strong feelings on both sides of the issue. One flashpoint is the fact that in recent years, foreign investment in US real estate is surging thanks to a weaker dollar and the increased availability of properties at unprecedented low prices. What does this mean for American investors and the economy as a whole? A recent report by the Wall Street Journal’s Market Watch notes that buyers from around the world are jumping into the tottering US housing market, with international real estate sales hitting $82.5 billion between the spring of 2011 and March 2012. A weaker dollar, a stable government and the continuing availability of numerous properties at low prices make the US an attractive place to invest. 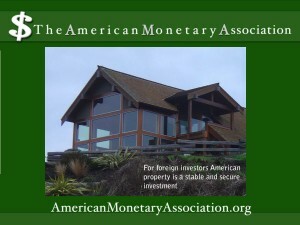 Although the notion of foreign investors may conjure images of multinational consortiums, foreigners purchasing properties in the US are actually quite a varied lot, ranging from the Russian billionaire who bought an $88 million New York condo for his daughter – for cash – to numerous upper middle class and professional people looking for a stable place to invest their savings, far from the turmoil and political instability of their home countries. A large percentage of foreign investors in the US are Canadian and British. Other frequent investors are Chinese, Indian and Mexican. These investors share some features, though. Many do pay cash for properties, although some work with local and foreign lenders to arrange financing. They tend to purchase properties in the warmer climes of the South and Southwest, and a large number of purchasers, about 40%, according to a Survey by the National Association of Realtors, keep the properties to use as either primary residences or vacation homes, rather than rentals. Another feature shared by foreign investors is that they tend to purchase condos and townhouses instead of single-family dwellings. And, since many are seeking residences and a haven for their money, these investors have little interest in multiplex properties. Some may eventually opt to rent the properties they purchase, but as American investors know, that requires ongoing maintenance and observance of tax laws and local codes and regulations. risk of political and economic instability, putting money into US assets is a prudent strategy that protects savings for now and in the future. And for those from the more stable European countries, American real estate presents opportunities not available at home. Do foreign buyers pose the risk of competing with American income property investors? In general, the two are different enough that it seems unlikely. Although individual markets differ, these investors typically choose properties that, as Jason Hartman maintains, are less than optimal for income purposes, such as condos and townhomes. And since their goal is often to use, not rent, the property, these buyers are unlikely to draw tenants from the pool of available renters in the area. And these investors pump funds into the economy in the form of cash purchases and outlay for upkeep and maintenance.